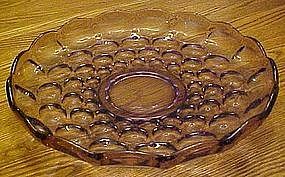 Original Heisey pattern that was reintroduced by Imperial glass in 1956. THis pretty purple or amethyst dish is referred to as a lily float bowl and measures 12" in diameter. Pristine condition. Has a very pretty ring to the glass andhas a ground and poloshed rim on the bottom. THis is a stunning piece.